Our genuine Grade A Maple Syrup is delicious poured over pancakes, waffles, french toast, donuts, cereal or ice cream. It can be used to flavor a milk shake, glaze a ham, added to vegetables, or hundreds of other ways. The darker colored syrups will have a more pronounced maple flavor and are great for cooking and unusual salad dressing and barbecues sauces. At the moment, we are stocked with all grades of syrup in most sizes. As usual, golden delicate is in limited supply with only a moderate amount produced this season. Please contact us if you are looking for something specific. In New Hampshire (and Vermont), maple syrup must be 66.9% sugar, as opposed to the USDA standard of 66%. All other states in the US, as well as the Canadian provinces subscribe to the 66% density standard. So, Yes! New Hampshire syrup is thicker than most. Once finished, maple syrup is graded according to color determined by light transmittance (absorption actually) as well as the flavor. For more than a decade, the US and Canada, through the International Maple Syrup Institute (IMSI) negotiated for changes in the proposed grading standards, that included flavor descriptors, ie. Delicate, Rich, Robust, Strong, to supplement the color monikers; golden, amber, dark and extra dark. The final standard was adopted in 2014/2015 with a phase- in period for producers & consumers to acclimate. The new grading standards essentially took the four former table grades (three Grade A and Grade B) and re-designated them into three grades total. While the former standard dealt only with the color of the sample, the current standard changed the color parameters to golden, amber and dark but also incorporated flavor descriptors of delicate, rich and robust, respectively. It is Mapletree Farm’s interpretation that the color and flavor descriptors must go together for a syrup to earn its grade. Admittedly, taste is subjective and can vary from person to person, but there should be no bitterness or off flavor in the syrup when it lands on your table. Grade A Golden Delicate Taste has replaced Grade A Light Amber. This syrup has a delicate, very mild maple flavor and is the lightest and most golden colored syrup produced. This syrup is typically made for a short period earlier in the season and is often used to make maple candy and cream. Grade A Amber Rich Taste includes syrup formerly graded as Medium Amber as well as the upper range of syrup that would have been graded as Dark Amber. This syrup has a richer and more pronounced maple flavor than Golden Delicate. Consumers wanting a full-bodied maple flavor of medium intensity will prefer Grade A Amber Rich. Grade A Dark Robust Taste includes darker range of syrup that would have been graded as Dark Amber and all of the color range formerly known as Grade B. This syrup has a stronger, more robust flavor than the lighter syrups described above. Consumers preferring darker syrup with a substantial or robust maple flavor will like this grade. Grade A Extra Dark Strong Taste includes the darker syrup generally made right at the end of the season. We only make a small amount of this syrup and when its gone, its gone until next season. This syrup typically has a flavor characteristic that eliminates it from being in the more conventional “table grades” described above. It may or may not be particularly dark, as the name implies, but it is just not what Mapletree Farm considers table syrup. Historically, this syrup has been referred to as cooking syrup. It may have a very strong flavor element or a caramel to it that is just not what we want on your pancakes; but it can be great for other uses, such as: barbeque and other sauces, baked beans, or as a sweetener substitute in baking. While some consumers may enjoy this grade of syrup, it is being offered on this website as a cooking substitute and not as a table syrup. 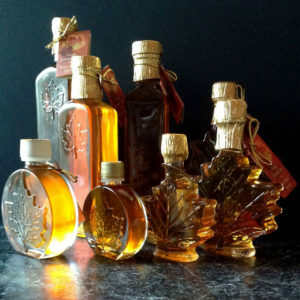 Consumers should also be aware that, this syrup changes, sometimes rapidly, over the last few days of the maple season and especially from one season to the next, so it is the least likely to be consistent from year to year or even container to container. At Mapletree Farm, this syrup will not be bitter or offensive in flavor, its just not mapley smooth…. Mapletree Farm started using the new International Grade Standards in our 2015 production year. Grading is performed to very strict standards and we are proud to earn the State of New Hampshire Seal of Quality.